The Enchanted Holiday Stocking was designed by Jennifer Bosworth of Shabby Fabrics. This stocking features a ruffled cuff, appliqued holly leaves, an embroidered name, and darling button embellishments. Every member of your family will appreciate a stocking handmade by you! 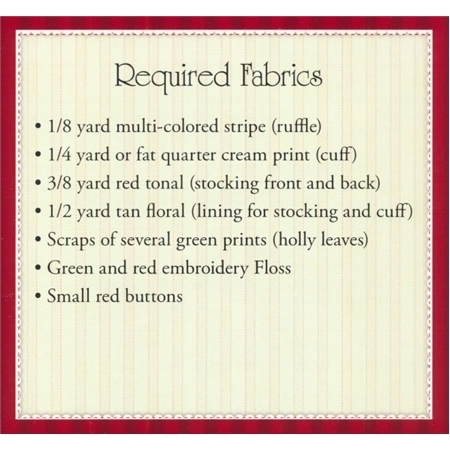 Specifically designed to coordinate with our Enchanted Holiday Tree Skirt and Enchanted Holiday Table Runner. Approximately 18" long.